Q: Why do I need climate controlled storage? Climate control maintains a steady temperature of 55–80°. This protects your possessions from damage from severe heat or extremely cold temperatures. Q: What should or should not be stored in a self-storage unit? Items that require electricity (refrigerators, freezers, generators, space heaters etc.). Q: What security do I need? When selecting a storage facility, you’ll want to understand what kind of security is in place to keep your items secure. Check the facilities hours of operation, surveillance cameras, locks and building security systems to feel safe. We usually have locks for sale at our facility, but if you have one or want something especially good – you can bring your own. Always prepare for the unexpected – if your items are valuable, you should insure them. Check with your insurance agent, you may already have insurance that covers the items you’ll be storing in your self-storage unit! Q: How long of a contract am I required to sign? Our storage units are rented on a month-to-month basis. Your rental with us can be long term or short term depending on your needs. 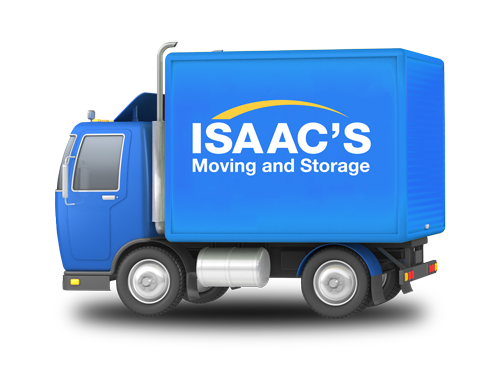 Q: Can I buy boxes and other packing materials from Isaac's Moving and Storage? We offer a wide variety of boxes and packing supplies for purchase. We also having packing and storage tips on our website to help you pack properly. Q: Does your company pack the storage unit? We provide packing services- contact us for details and a free quote.